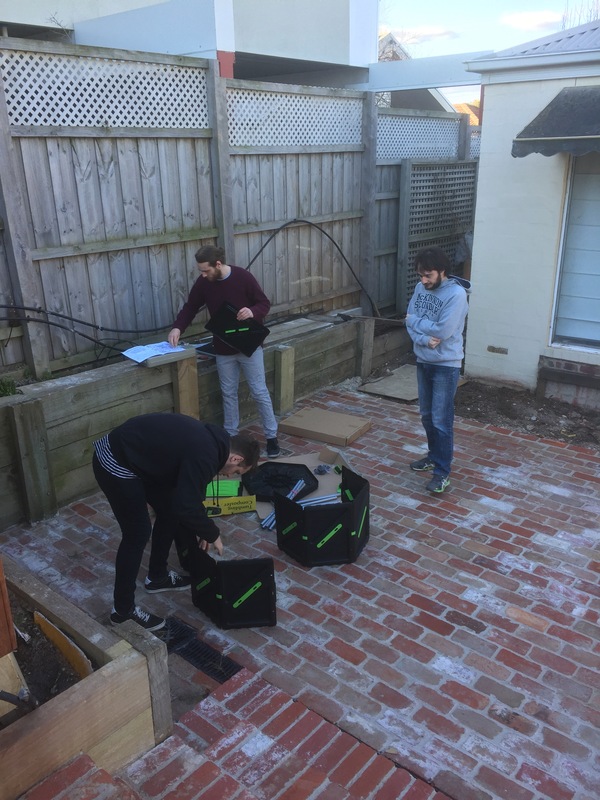 I’m pretty sure I showed you guys a picture of my sons assembling a tumbling compost bin a few weeks ago. I’ve never owned one of these before. In the old place, I just had a couple of those huge, open-bottomed bins that you place on the ground, take about a year to fill up and then wait for another 2 years before the stuff inside becomes usable. I wasn’t a fan. I’m not getting any younger and with the soil turning my plants yellow in the wicking beds, I don’t have years to waste. I did my research and it seems that with the tumbling part of the tumbling bins, compost can be ready in weeks instead of months or years. Imagine how delighted I was when I saw that some genius has invented a tumbling bin with TWO drums!?! You fill up one drum and then continue tumbling it, while filling up the other one with your veggie scraps and old newspapers. When one drum is full of compost, you empty it and then start tumbling the other bin while you’re filling up the first one again. It’s a never-ending circle. Of life. Of compost. It’s a beautiful concept. 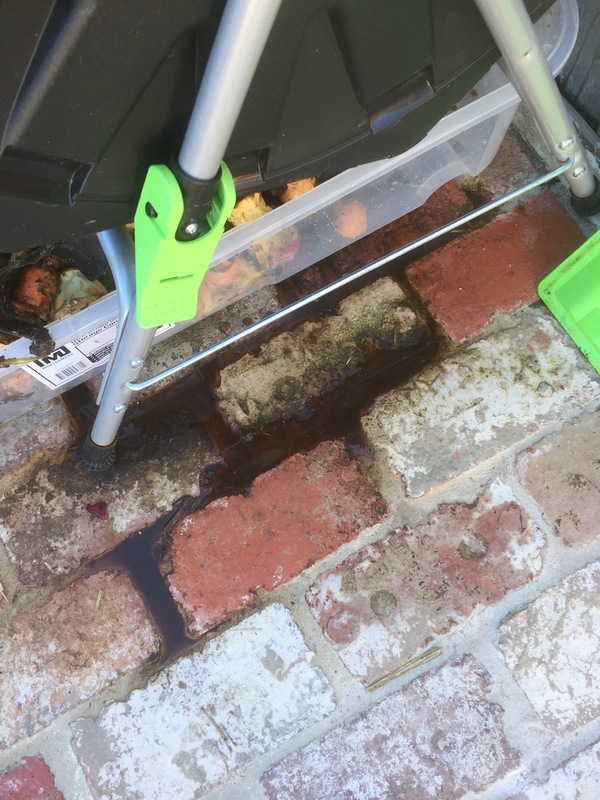 At first, I had the bin in the backyard on the new brick paving, but I didn’t think of the ‘compost tea’ that leaks from the bins. It was going to stain my paving!!! Argh!!! What could I do? The bin was too heavy to move. Then Ryan23 said, “Why don’t you empty out the bins and then move it?” Sometimes people need to state the obvious to me. I’m not terribly practical. So I emptied out the stuff in the bins. Not the most pleasant job. Poppy and Scout started stealing things to eat from them as I was moving the bins and in the end, they got into a squabble over an aromatic morsel of banana peel or melon peel. So I locked them both in the garage away from temptation. Stupid dogs. So I began again. 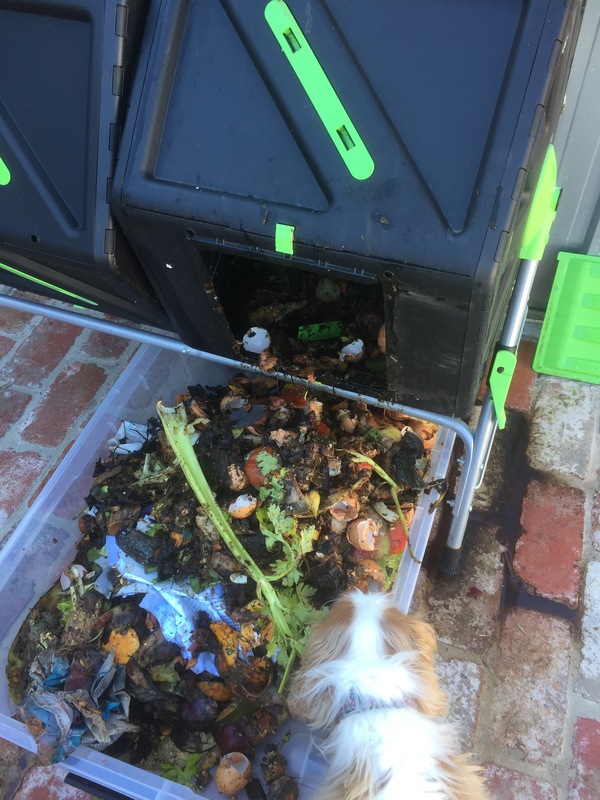 I still had to keep an eye on the worm farm so that I didn’t starve them in my quest to get compost for the garden, but after a couple of weeks, I realised that even filling up one drum was going to take a fair amount of time with just our household scraps. That’s when I had a Brilliant Idea. At heart, teachers all want to save the planet and be wonderful. You couldn’t be a teacher for more than 5 minutes unless you feel this way. 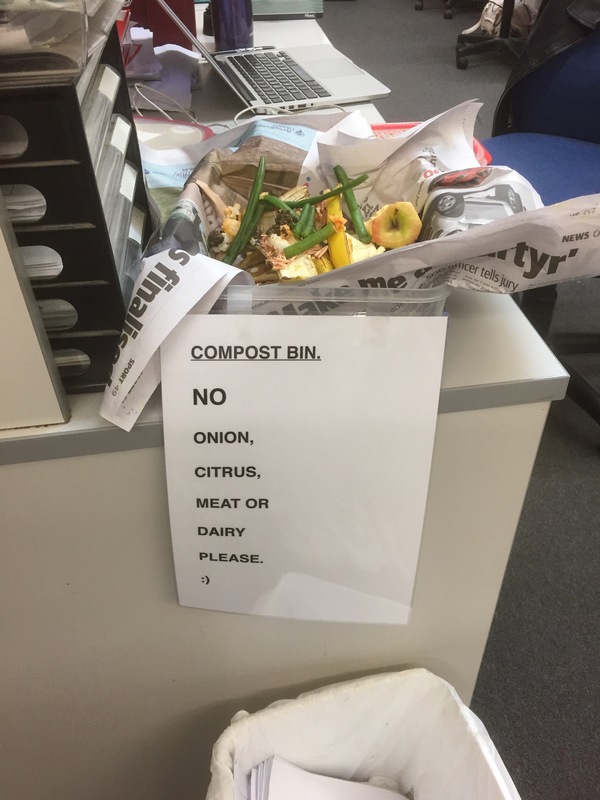 So I introduced the Staffroom 2 compost bin. It sits on the end of my desk, just above the bin, and people drop their banana peels, apple cores and tea bags into it. Everyone loves it! They get to feel the glow of doing the right thing by Mother Earth, while I get to accelerate the amount of compost I can make. It’s a win/win. After a week or so, I started to think outside the box of staffroom 2. Just down the hall is the Food Tech room, full of stoves and chopping boards and kids cooking their little hearts out. Maybe they’d like to donate their scraps instead of giving them away? Our school has 2,300 students and around 200 teachers. The canteen services hundreds of people every day. There’s a goodly amount of chips, nuggets and potato cakes that are sold, but there’s also a huge amount of salads, meals, soups and fruit salads that are sold as well. Imagine the scraps??? I’ve had to buy another tumbling compost bin. Can you see the trays underneath? I’ve been harvesting the compost tea, diluting it and using it as fertiliser. I’ve just started filling up the 4th bin in the system, so soon I’ll be using homegrown compost on the garden. This entry was posted in gardening, School, vegetables, wicking beds. Bookmark the permalink. 5 Responses to Skinflint Sunday: Free compost materials!! Why wouldn’t you? Didn’t I just see this? Oh, right, was that at the other blog? 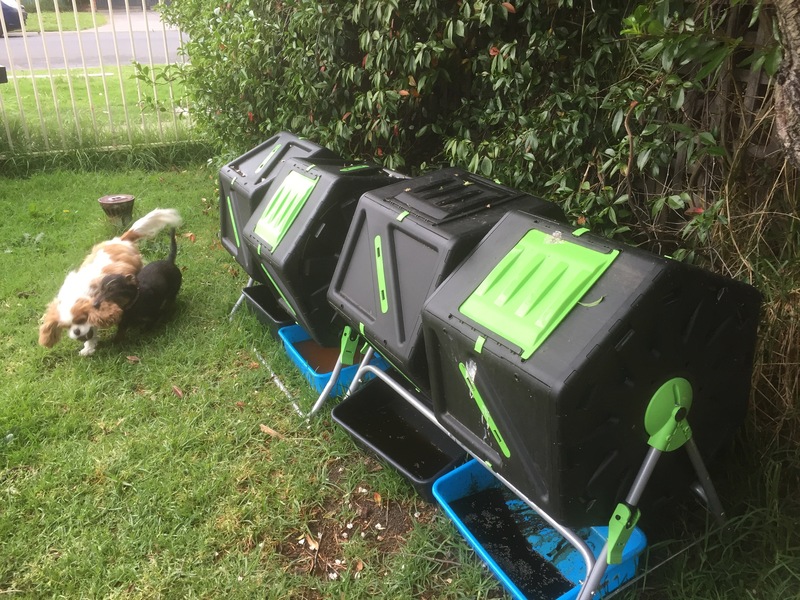 Anyway, compost tumblers are great! I have the big Tumbleweed one. 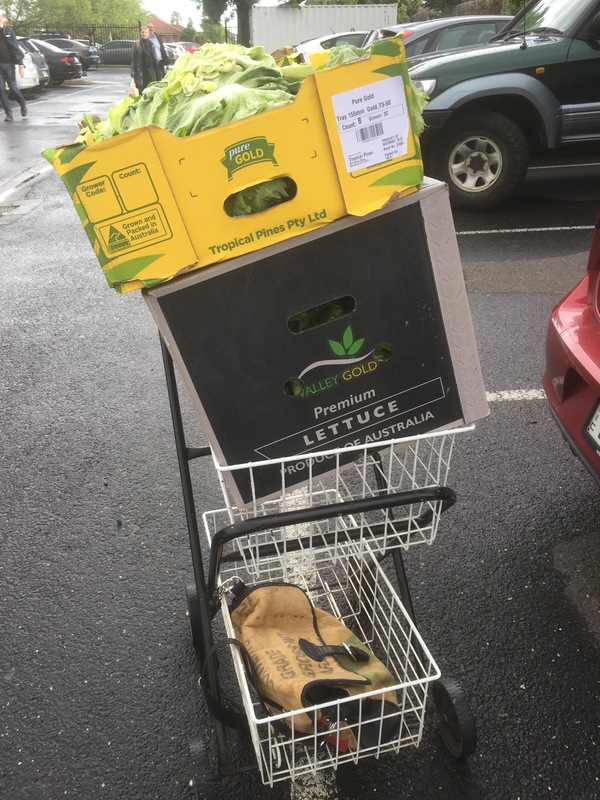 Once a week it gets the floor sweepings from the chook coop….sugar cane mulch plus chook poo…and it takes no time to break down into usable stuff. I give it a few turns each time I pass. I did think of adding worms to help the process but then thought constantly being tumbled around might give them the worm equivalent of vertigo. I mentioned this on the other blog, but this blog gets the ‘down and dirty’ treatment. I had a look at the first drum I started filing a few weeks ago, and I’m surprised at how quickly things have broken down. I’m pretty pleased so far. Good for you! I used to compost everything I could. It works well and give you a satisfaction of thrift and cycles. 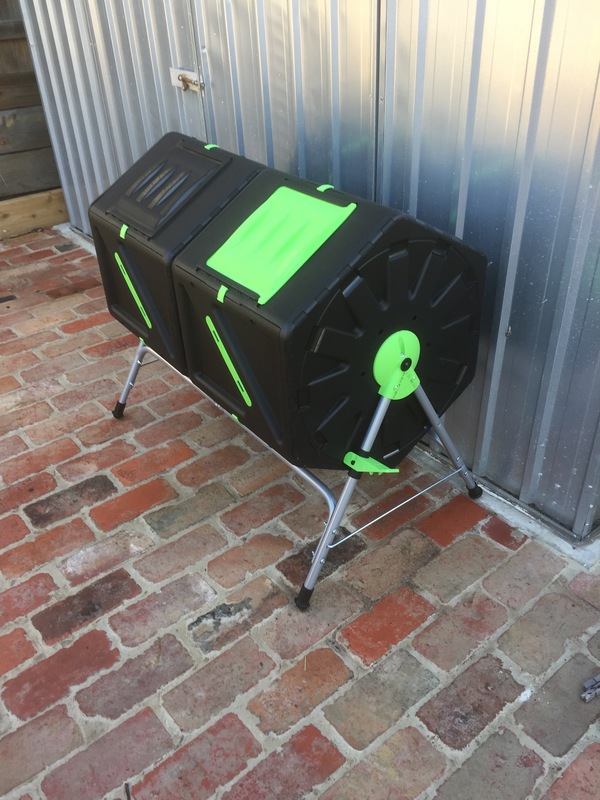 0Great tumbling composters. O another blog (that I can’t find at the moment) they had similar worm farms in each garden bed that were mostly in the actual bed with the soil almost up to the top, but not quite. Could be a way to help prevent your worms overheating in a Victorian summer. Happy growing and eating, Michelle in Wellington, NZ. That’s not a bad idea. I’ll see how the worms go with bean plants sheltering them. If it all turns into a worm stew, yours is the next thing I’ll try.